At Premium Home Interior you can find the fixtures and products to add the perfect finishing touches for your home. From modern styles to traditional looks, we offer quality ceiling fans, lighting, lamps, mirrors, rugs, art and more. Our handpicked lines bring to you trusted brand names such as Tech Lighting, Fanimation, Modern Fan, Besa Lighting, ELK Lighting, Dimond Lighting, Dimond Home, Emerson Fan, Matthews Fan Company, Mirror Image Home, Wendover Art, Nuloom and more. We have a passion for home products and design, and we know the right décor can transform a living space and its inhabitants. Our goal is to bring beautiful, high quality products to our customers at the lowest possible prices. Check out our blog posts which include helpful information such as a how to select a ceiling fan to tips on getting ready for summer. Coming home should feel like a long exhale. When you enter a beautiful, serene environment, it makes the stresses of daily life melt away. Let us help you create the perfect refuge from the world by adding the perfect lamp, rug, fan or light. Upgrade your bathroom with beautiful new vanity lights, or add a modern touch to your dining room with a new glass chandelier. Make your outdoor space come alive with a cooling outdoor ceiling fan. Along with the best products we strive to give you excellent customer service. If you have any questions feel free to give us a call and we will go the extra mile to answer it for you. 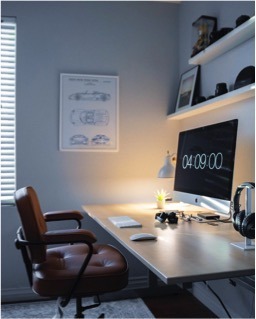 Big Ideas, Small Spaces: How to Turn Part of Your Home Into a Productive Home Office - read this and other posts here.